An exciting climax to this season’s amateur all-weather championship saw 4 amateurs go into the finale at Wolverhampton on equal points of 12 each to contest the race for the title. Tension was added to the build-up with freezing weather causing racing uncertainty but the racecourse passed an early morning inspection to the delight of all concerned. As predicted in the betting markets, the closing stages of the race were fought out between two jockeys at the top of the AW league tables – our two reigning Flat champions. Mick Easterby trained BRIGHT SPARKY stayed on gamely to give Serena Brotherton no cause for concern and her 3rd win on the dirt this season, 3/4 of a length ahead of Simon Walker and AMICAL RISKS. 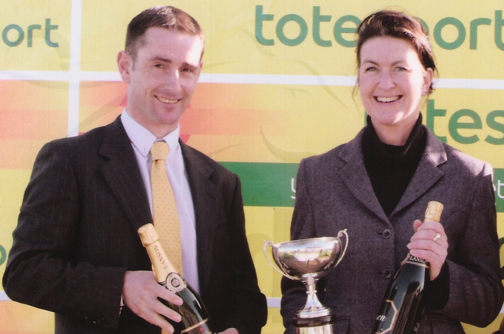 Congratulations to all amateurs who rode winners on the All Weather this season. The complete season’s points table will shortly appear within the tables section on this site. All-Weather Amateur Championship up for grabs with 4 top jockeys sharing pole position! The four top jockeys in pole position include reigning Champion Amateur All-Weather jockey Simon Walker (who also holds the Amateur Gentleman Jockey Flat Championship) as well as reigning Amateur Lady Jockey Flat Champion Serena Brotherton. Good luck to all jockeys concerned in the finale! 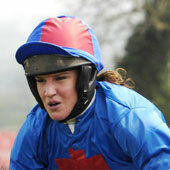 Update 22nd February: Rides today are booked for Simon Walker, Serena Brotherton and Joshua Moore. Watch this space! Bangor’s hunterchase, ultimately won by VICARIO ridden by Josh Hamer, saw Sarah Phizacklea take a horrendous fall at the second fence on ANOTHER RIVER in which the rotational fall of the horse resulted in Sarah taking the full force of the impact when the horse hit the ground. Incredibly, although Sarah was knocked out and moved to Wrexham Maelor Hospital for further examination on a backboard, the only lasting damage is a small broken bone in her leg and she is otherwise unscathed. Sarah returned home last night and we wish her a swift recovery. Ireland hosted the 55th General Assembly of Fegentri at The Turf Club, Kildare on Saturday 6th February and the Gala Dinner was held that evening in Newbridge. 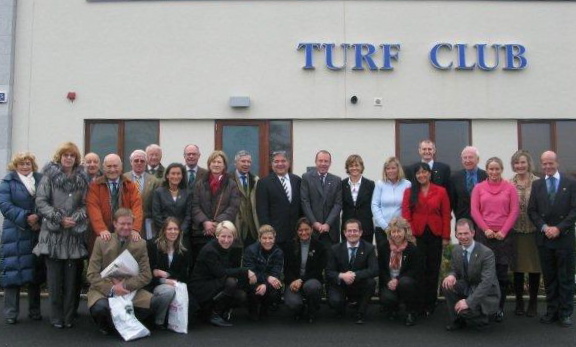 Delegates from Belgium, Denmark, Germany, Great Britain, Ireland, Italy, Norway, Qatar, Spain, Sweden, Switzerland, Turkey and the United States enjoyed the weekend which included a trip on Friday to the Irish National Stud and also to Gilltown Stud were Sea The Stars was led out to a very appreciative audience. Ian Chanin, 2009 GB representative (whose Fegentri season was cut short by a broken leg) attended the ceremony on behalf of 2009 Lady World Vice Champion Claire Allen to receive her award which was presented to him by AJA Vice President Dr Philip Pritchard. A major improvement in the Fegentri score system was unanimously agreed at the GA when one single score system was decided upon for 2010 and the future, eliminating the old double points system of “home” and “away” scores. Paul’s Place is the only charity that specifically supports adults with any physical and cognitive impairment in the Bristol area, covering Bristol, South Gloucestershire, North Somerset, Bath and North East Somerset. (Have a look at www.paulsplace.org.uk for further information.) In support of this charity, Chepstow Racecourse have very generously agreed to host a charity race on Thursday 25th March. The British Horseracing Authority have granted exemptions from the effects of Rule A38 for this race as it is being run outside the Rules of Racing. Therefore it will not count for any purposes on the horse’s career record. deposit at least £750 before weighing out in order to participate. Riders are encouraged to use Just Giving when raising sponsorship. If YOU would like to take part, please call or e-mail Sarah Oliver on 01886 884488 or sph.oliver@btinternet.com to secure your place. 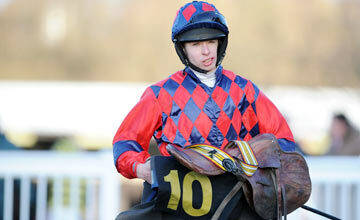 WOLVERHAMPTON PROVIDES MEMORABLE DAY FOR PHILIP PRINCE AND MICHAEL OWEN! On only his second appearance on the racecourse, 17 year old PHILIP PRINCE, who fought a year-long battle with the BHA to be granted his jockey’s amateur licence, enjoyed his first winner when partnering MISS FIREFLY to victory in the first division of the 6f amateur riders’ handicap at Wolverhampton. The second division of the handicap saw a first win on his debut ride for event rider MICHAEL OWEN on Frank Sheridan’s ALBERO DI GIUDA. Michael has regularly ridden around Burghley and Badminton but with racing in his blood, he has always wanted to ride under Rules and had a dream start to his riding career today. Many congratulations to both Philip and Michael on such a memorable day.